Average Height	: 15" - 17"
Average Weight	: 26 - 35 lbs. The Cocker Spaniel is a hunting-gun dog able to work in difficult terrain in both wet and dry land. Excellent at flushing and retrieving game with a gentle mouth. It listens to commands well. Evidence of the spaniel goes back as far as 1300. At some point, they became divided into two types: land spaniels and water spaniels. But, it wasn't until 1800 that the spaniels were divided into seven separate breeds: the Welsh Springer, English Springer, Sussex, Clumber, Field, Irish Water and Cocker. You'll also hear of the Devonshire Cocker. Essentially, any spaniel weighing less than 25 pounds was considered a Cocker during this time. All of these breeds began from a Spaniel sort of dog that came to England centuries ago, and the breeds were developed from there. In these days, puppies that did not prove to be up to the hunting challenge were often killed, as they were not considered to be companion or show dogs. In 1885, however the Spaniel Club was formed in England, and the dogs began to be used for show, with both the Springer and the Cocker in the same category. Until 1892, Springer Spaniels and Cocker Spaniels were considered basically the same breed, with the only difference being size. In 1892, the Kennel Club of England recognized them as separate breeds. From this point on, different traits were bred into the two different breeds, and today the Springer and the Cocker differ in many ways in addition to size. Cocker Spaniels were bred to hunt. Their smaller size made them easy to transport and the perfect size for bird hunting. In fact, the name Cocker Spaniel comes from the woodcock, the bird this dog originally hunted in old England. They were prized as hunting dogs because of their impeccable retrieving capabilities, their ability to handle rough terrain and their energy and endurance. Originally known as a general spaniel-type dog that was imported into England centuries ago, the dogs were divided into seven different spaniel breeds: the English Springer, the Cocker Spaniel, the Clumber, the Sussex, the Welsh Springer, the Field, and the Irish Water. There are two lines of English Cocker Spaniel; the field line and the show line. Field lines are bred for hunting and often have physical characteristics that make them unable to compete in the show ring. For example, field dogs are bred to have shorter ears and a shorter coat to make them lower maintenance. Show dogs are expected to have very long ears and the long coat, which is considered more attractive. In addition, field dogs are bred to be more active and athletic, possessing great endurance. In the US today, most Cocker Spaniels are purchased to be companions rather than hunting dogs. The American Cocker Spaniel is the second most registered dog with the AKC. The English Cocker Spaniel is not as popular in the US, but is one of the most popular companion dogs in England. •	Eager to please & like to bond with the family. •	Bred to hunt they like to chase things. Be sure to keep them on leash until you have good control of them off leash. Keep in fenced, safe areas. •	As a Sporting breed they need daily exercise, or can easily gain weight. •	Prone to ear infections. •	Can be difficult to house train. •	Can be a barker. •	English Cockers are larger than the American Cocker Spaniel. •	Have a lot of stamina and energy. •	Excellent retrievers, delicate mouths. •	Intelligent, can be stubborn as well. •	Love to be mentally stimulated, love to learn. •	Great at tracking, obedience trials, flyball and agility. •	Can suffer from separation anxiety if left alone for long stretches. •	Get along well with children. •	#1 breed known for biting Vets [that's what Vet's say, anyway]. •	Average guard dog abilities. Field lines of Cocker Spaniels are very active dogs. If you're choosing a dog solely for a family pet, particularly one that will spend most of its time indoors, don't choose a field line dog. 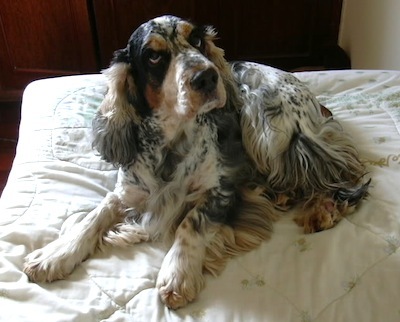 The Cocker Spaniel requires regular combing and brushing, as their texture makes them particularly prone to matting and tangling. They'll likely need to be bathed a bit more often than some other breeds, too. They are average shedders and will need to have the hair around the pads of their feet trimmed regularly. As with other spaniel breeds, ears must be carefully attended to in the Cocker Spaniel. Because they are low hanging, they are prone to ear wax and infections. In addition, they can attract burrs and ticks, which, un-attended can cause deafness. Clean and check your dog's ears regularly, and be certain to check the bottoms of the ears for ticks and burrs after he has been outdoors playing. Most Cocker Spaniels can handle as much exercise as you can provide. Particularly when outdoors, they are tireless. This is a great breed to consider for agility or other competitive dog activities, as they love the excitement and the exercise. They are excellent at tracking and retrieving activities as well as agility, and of course they make great hunters. Before you purchase this breed, you must be committed to providing them some sort of daily exercise, whether it's a walk in the park or a romp in the yard. Cocker Spaniels are intelligent working dogs, and their temperaments incline them to be obedient and loyal. Once in a while, particularly if you own a female, you'll find a cocker who is very stubborn, but generally, they are quick to recognize you as the boss and to obey your command willingly. Cockers who are field dogs are especially quick to bond and obey with a master who takes them on the hunt, as they seem to know instinctively how this relationship is supposed to work. Cockers, like all dogs, need firm obedience training until they understand that you are the alpha dog. However, once this is established, you'll find the Cocker Spaniel to be very intelligent and easy to train. In fact, this breed is one of the best at competitive obedience training. They can be sensitive, so don't make your corrections too harsh when training. Firmness, patience and consistency will work best when training a cocker. Once you've mastered basic obedience training, this is a great breed to train for more complicated activities. They love to do tricks and can be trained for nearly any competitive dog activity. Since they were bred to be a working dog, they will appreciate having a purpose in life beyond being a companion. Hunting spaniels are some of the best trained dogs in the world. They are amazing in their ability to work alongside their master, seeking direction and often responding just to hand signals. They have an uncanny ability to locate and flush out birds, as well as to locate them and retrieve them after they have fallen. Watching a Cocker Spaniel at work in the field is a joy, as they so obviously love the hunt and are so instinctively good at it. Hup-Sit and Stay. This command is basic obedience of course, but is used extensively in the field to allow the hunter to catch up to the dog. Retrieve to hand-The dog is trained to retrieve the bird and hold it in its mouth until the hunter requests that it be given to him. Quarter-The dogs work in a pattern in front of the hunter when seeking out birds. The dog must stay close enough to the hunter to be in shooting distance, so that they don't flush out birds that are too far away to be hit. Hand Signals-During hunting, the dog will be given hand signals for direction by the hunter. This helps keep the area quiet when hunting. Steady-This command means that the dog must sit when a bird rises or a gun is fired. This helps him mark the fall of the bird and avoid flushing other birds when pursuing a missed bird.